Being an affiliate provides you with a great opportunity to build your own email list. You can setup a mini-site which outlines the benefits of the product or service you are promoting and add an opt-in form to the site where people need to enter their email address and name in order to access the product sales page. 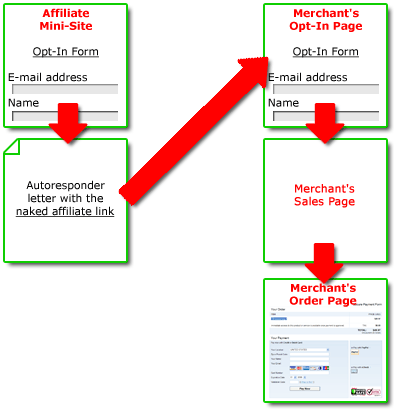 You also setup an autoresponder that will send a confirmation letter or open a confirmation page after signup and you provide the visitor with a referral link that includes your affiliate ID and normally leads to the merchant's sales page. But it can happen that the referral link leads to the merchant's opt-in page. So, people have to opt-in again in order to get to the actual sales page. This can be a real problem because double opt-in procedure turns many visitors away. They have already signed up and they must do it again. It's nonsense! The situation becomes worse if you send them follow-up emails offering other products from the same merchant and refer them to the opt-in page where they are forced to subscribe again, again and again. The result – you lose potential purchasers and commission. That's the real problem. So, you need to be able to bypass the page with the merchant's opt-in form and send people directly to the sales page. This is what exactly you can do with G-Lock Affiliate link Cloaker. Click Save to Disk to save your encrypted affiliate link to the somepage.html file. Upload the somepage.html file to your web site. Refer people in your confirmation letter or page to the somepage.html page that will then redirect them to the merchant's sales page. 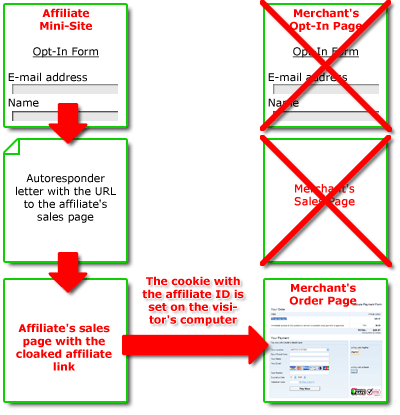 Encrypt your affiliate link and the merchant's sales page using G-Lock Affiliate Link Cloaker. Upload your stealth page on your website. 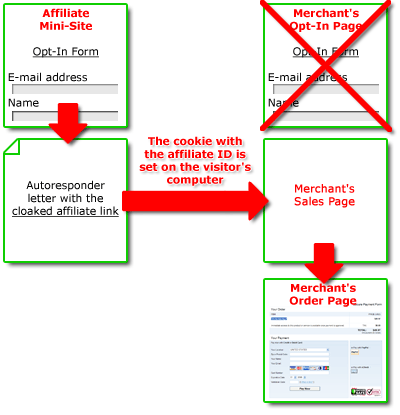 Refer people to your stealth page that redirects them straight to the sales page bypassing the merchant's opt-in page and sets the cookie with your affiliate ID. Get commission from every purchase. Signs up on your mini-site. Clicks on your referral link. The affiliate cookie sets up on the visitor's computer. Goes directly to the sales page to purchase the product. This is an advanced technique of using the cloaked affiliate links. If you don't like the merchant's sales page, you can create your own sales page for the product or service you are promoting as an affiliate and send people directly to your sales page bypassing the merchant's sales page. The advantage of this tactic is that you have a full control over the sales page. You can edit it as you want, tweak it to increase your conversion rate and sales. Point the "Buy Now" button on your sales page to the somepage.html page and refer people in your confirmation letter to your own sales page. Please, share your thoughts on the article in comments.